There’s something romantic about shooting with continuous lights. I find the moody, hushed atmosphere they create to be more conducive to connecting with my subject than a room full of beeping power packs and loud unnerving strobe pops. Cinema often influences my visual work. Watching old black and white movies after school left a stylistic residue on my minds eye that still informs my visual choices. This vintage aesthetic made it easy for me to transition to continuous light sources when DSLR video emerged onto the photo scene. Sony α7R , Sony FE 55mm f/1.8, ISO 800 1/125 F/4.0. A Fiilex Q500 skims her body from an elevated position behind her camera left. Her face is lit with a bounce card reflecting the Q500 and a P360 light on it’s lowest setting to create the catchlight in her eyes. There are a lot of continuous lighting choices to choose from in today’s marketplace. HMI’s, “Light Brite” style LED Panels, Tungsten fixtures, fluorescent bulbs etc… I’ve tried most of them out and they all have their pro’s and con’s. My ideal light source would be an LED version of a tungsten or HMI light fixture that puts out a soft light, flattering to skin tones. I would also be able to dial in the level of warmth or coolness and it wouldn’t give off enough heat to fry an egg off my subject’s forehead. My friend Brent Siebenaler showed me exactly what I was looking for when he brought prototypes of the Fiilex LED lights to my office. He arranged for me to try out a set of P360’s and a Q500 with glass fresnel. Seeing the quality of light from these LED’s reminded me of Hollywood Glamour lighting from the 40’s. That became the inspiration for this shoot and a seminar for Samy’s Camera at the Palm Springs Photo Festival. Sony rep Marcus Couvson contributed to this test by loaning me an A7R with the Sony FE 55mm f/1.8 lens to try out with the Fiilex lights. From the first time I looked through the gorgeous EVF (electronic viewfinder) I was hooked. The dynamic range combined with one of the best lenses ever made sealed the deal. This shoot was the turning point where I moved up from my Sony Nex-7 to a full frame Sony α7R and got rid of my DSLR gear. These two images were inspired by minimalist sets with deep dark backgrounds shot by photographers like Hurrell in the 1940’s. A hollow core door was painted charcoal gray and used to add depth to the set by dividing the light and dark areas. A Fiilex Q500 with glass fresnel was the key light placed above and camera right of the model. 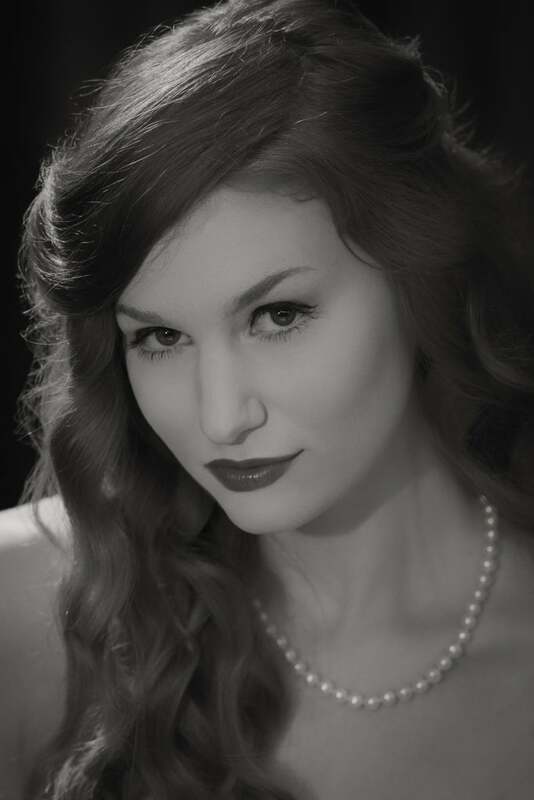 The way the shadow falls on the models face is important when shooting a retro glamour photograph. This setup is called Loop Lighting because of the shape of the nose shadow on the subjects face. I added a P360 light on the lowest power to create a catch light in the models eyes without overpowering the loop shadow. The quality of light from the Q500 fresnel is creamy and gorgeous while maintaining nice contrast and shadow detail. Once I had my selects chosen in Lightroom, I cleaned up the hero shots in Photoshop and ran them through Silver Efex Pro 2 for black and white conversion. I chose Soft Sepia as my setting in Silver EFX Pro which gave the images a retro vibe and warmth without degrading the rich blacks. I took the photo above in my seminar at Palm Springs Photo Festival. Samy’s Camera had a classroom set up near their sales booth in a conference room at the Hyatt. I dimmed the overhead lights so that the background would go dark and used a P360 with barn doors high and camera left. An additional P360 was the key light just over the models face camera left. A white reflector filled in the key light to soften the shadows for a romantic glow. I used the α7R again but this time my lens was an old Minolta MD 135mm 3.5 that I bought on eBay for $27. This is another advantage of a mirrorless camera system. The flange depth is shallower than on traditional 35mm cameras that have to make space for a mirror to flip up when you activate the shutter. 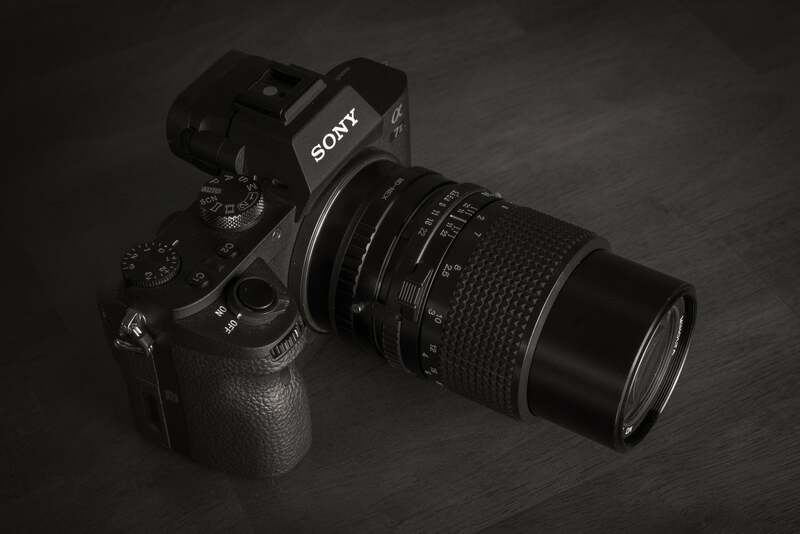 To use other lenses on Sony cameras only requires an adapter that acts like a spacer placing the focal plane in the same position as if it were on the native camera system. The Fotodiox MD to Sony adapter was $23 on Amazon (almost as much as the lens). Manual focusing is a breeze on the EVF with focus peaking where in-focus pixel edges get outlined in red. I just focus until the catchlights in the eyes turn red and it’s spot on.